Heineken® team up with Themba Mekwa and Karabo Poppy Moletsane to shape the City of Gold! As part of Heineken®’s #SHAPEYOURCITY competition, a once in a lifetime City Shaping Experience is on the cards for the City of Gold. But it will take YOUR votes to secure this memorable experience for Johannesburg. In Heineken®’s global campaign to transform the cities of the world, Joburg, Cape Town or Durban, will set the stage for a unique show-stopping event in a proudly South African context. Three teams of select ‘City Shapers’ in each metropolis will compete to bring to life, an iconic and highly visible installation that will capture the public’s imagination. Ultimately, Heineken® wants city lovers to see their city in a totally different way. 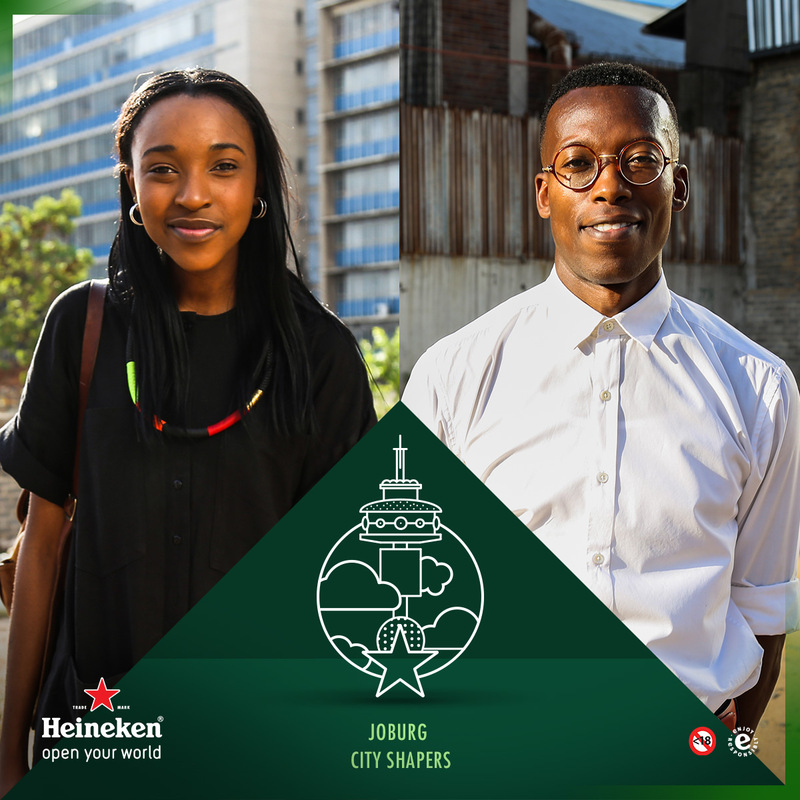 For Johannesburg, Heineken®’s passionate ‘City Shapers’, Mastermind designer Themba Mekwa, and Loerie winning creative trailblazer Karabo Poppy Moletsane are working with the brand on the mind-blowing city shaping experience. Originally from South Africa, Themba Mekwa was raised in the States, but returned to his roots to make Joburg his home. An architect and design mastermind who co-founded his own design company, The MAGI Starchitecture, this quintessential city dweller with his impeccable sense of style can hardly wait to embrace new and creative approaches to contribute to Joburg’s #SHAPEYOURCITY experience. Joining forces with Themba, the equally talented Karabo Poppy Moletsane is a Loerie award-winning illustrator, print designer, graphic designer and more recently, business owner of Mother Tongue Creative House. Karabo’s work reflects a strong South African aesthetic, and when it comes to illustration, her keen eye will add to the artistic appeal of Heineken®’s event. Her uniquely South African approach to graphic design will undoubtedly inject the installation with local flavour. “Partnering with Themba and Karabo has created a unique opportunity to create a spectacular experience unique to the city. Joburgers – get voting!” says Themba Ratsibe, Marketing Manager, Heineken® South Africa. So grab a Heineken, find the unique code under your bottle cap and dial *120*222# to enter your code and vote for either Joburg, Cape Town or Durban as the city you’d like to see receive a City Shaping experience. By voting, you also stand a chance to win the trip of a lifetime to Heineken®’s home city, Amsterdam, as well as great instant prizes. Relive the Strongbow Butterfly Effect Remix in Braamfontein!